? Introduces the new generation of Cisco® Catalyst® switches with Multigigabit Ethernet technology, the first platforms to combine support for multigigabit wireless speeds with full power over Ethernet (PoE) in an easy-to-deploy solution.
? 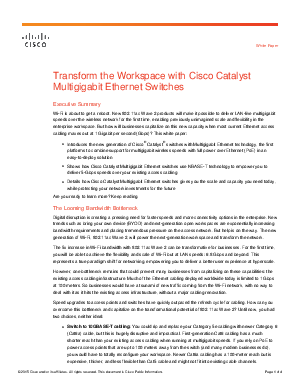 Shows how Cisco Catalyst Multigigabit Ethernet switches use NBASE-T technology to empower you to deliver 5-Gbps speeds over your existing access cabling.
? Details how Cisco Catalyst Multigigabit Ethernet switches gives you the scale and capacity you need today, while protecting your network investments for the future.